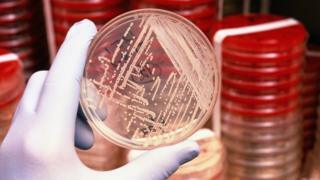 The first case of an infection that resists the antibiotic of last resort - colistin - has been detected in the US. The 48-year old woman from Pennsylvania recovered and the infection was vulnerable to other antibiotics. However, colistin is hugely symbolic as it is used when other drugs fail and officials warned the world was now reaching "the end of the road" for antibiotics. Colistin resistance was first discovered in China at the end of 2015. The study sparked concern around the world, and intensive testing rapidly discovered bugs that can resist colistin in Europe and Asia. Now data from the US has identified the first case in a patient, who had a urinary-tract infection, as well as colistin-resistant bacteria in farm animals and meat on supermarket shelves. It is not clear where the infection came from as the patient had not travelled recently and colistin is not widely used in the US. The DNA that gives bacteria resistance to colistin - the mcr-1 gene - can spread rapidly between species. The concern is that colistin resistance will now hook-up with other forms of antibiotic resistance to create infections that cannot be treated. Thomas Frieden, the director of the Centers for Disease Control and Prevention, said: "The more we look at drug resistance, the more concerned we are. "The medicine cabinet is empty for some patients, it is the end of the road for antibiotics unless we act urgently." However, Dr Beth Bell, also from the CDC, said in an interview: "Luckily haven't seen actual bacteria that are resistant to every single antibiotic." Commenting on the reports Dr Nasia Safdar, from the University of Wisconsin School of Medicine and Public Health, said: "The results are very concerning. "It is almost inevitable that more cases will come to light. It's just a matter of how quickly things spread. With carbapenem-resistant Enterobacteriaceae, soon after the initial description it became fairly widespread and not just in the US but globally. "It wouldn't be a stretch to say that we are towards the end of effective antimicrobial therapy for antibiotic resistant bacteria."